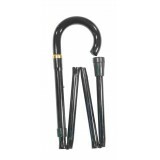 Our folding canes are immensely popular because they combine practical function with elegant design. Many people find them useful because they can be folded away when not required, for example, when in a car or aeroplane, or in a restaurant. 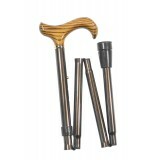 All our folding canes are height-adjustable. This is a very useful feature, especially if the cane is being bought as a present for an absent recipient. 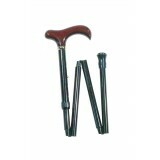 A traditional folding stick with a crook handle. 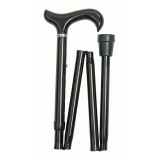 The strong and light black aluminium shaft i..
A classic folding stick. The maple derby handle is stained and varnished a rich, deep burgundy an..
A classic folding stick. The ash derby handle has been scorched to bring out the interesting ..
A smaller-proportioned folding stick suitable for smaller people. The hardwood derby handle i..